HB Insider - what software are you using? 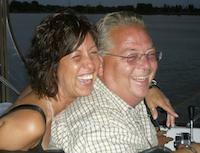 I am Linda, wife of Ian, the creator of this website all-about-houseboats.com . I have some sad news to share with you…..after battling lung cancer for the last year and putting up a valiant fight, Ian passed away in March of this year. Ian loved this newsletter, website and was passionate about being a house boater and I know he loved sharing his passion with you all. It was his desire that this website continue on and remain active and viable. Although I can never match Ian’s vast knowledge, I have surrounded myself with a team of house boaters and other experts so that we can continue to honor Ian’s wishes to share his passion for houseboats with this community. Since the summer is coming to an end, that means that there is less than a month until the fall. You want to get a head start to prepare for any bad weather, we seem to be experiencing more and more each year. Let's get going and dive into this month's newsletter right away. Preparing your Houseboat from impending bad weather is always important. From hurricanes to flash floods, keeping your home safe and secure during these turbulent times means taking a few simple precautions. And there's no better time than the present. * Does a houseboat need to come out of the water for a survey? * What are you thoughts about letting my houseboat freeze in the lake? * I'm now thinking and planning on building a second BIG house boat. Statistics show that not all the Houseboat Insider subscribers actually own a houseboat. Many of our new readers may be looking to buy a houseboat, or may be looking to buy a new boat, or may be wanting to transport a boat, or looking to finance a boat, or looking for a great vacation rental deal?